The price action in the equity markets today was nothing short of impressive. We literally had a W shaped trading day where stocks opened down 600 points, rallied back into positive territory, sold off again by another 600 points before recovering most of its losses by the end day. The volatility that we have seen in the currency market is only an extension of the movements in equities. 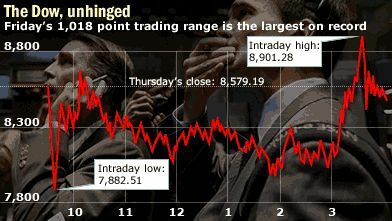 On an intraday basis, the Dow saw a 1000 point swing, with stocks up as much as 300 points in the last hour of trading. Two very different factors drove the sharp reversal – no one wanted to be short carry trades going into the G7 meeting and the money from the Lehman credit default swaps are coming back into the markets. Even though the economy could still be in for more trouble over the coming months, there is a case for a major bounce next week. Many people are arguing that this week’s sell-off in stocks is tied to the need to raise cash to settle the Lehman Brothers’ credit default swaps. For those who bought protection against a bankruptcy on Lehman brothers, they are set to get 91.375 cents on the dollar. The sellers of the protection will now have to make cash payments of more than $270 billion to the buyers. As the money changes hands, those who have bought protection could now put their payments to work in the equity markets which could pave the way for a serious bounce. A Look at P/E Ratios: Are Stocks Becoming Good Values? The Dow Jones Industrial Average has fallen more than 40 percent over the past year, leaving many investors wondering whether stocks have finally become cheap. Price to Earnings or P/E ratios has fallen to the lowest level in 23 years. With the S&P 500 trading at 860, the estimated P/E ratio according to the NY Times was just below 12. Over the past century, the average P/E ratio was approximately 15.5. According to a study by Yale Economics Professor Robert Shiller, the P/E ratios in the UK and Germany have fallen to levels that have only been seen 4 or 5 times in 150 years. From that perspective, P/E levels have fallen significantly but it is important to remember that earnings are expected to decline and P/E ratios always fall below the average in recessions. If economic conditions are as bad as the stagflationary period of the 1970s, then P/E levels could still fall to single digits. USD/JPY is due for a bounce, but in the long run, the prospect of further rate cuts from the US should continue to drive the currency pair lower. In addition to the G7 meeting, we are expecting US producer prices, consumer prices, retail sales, manufacturing and housing market reports next week.